MODRATEC places Mechanically Interlocked Lever Frames within the reach of any rail modeller. Interlock signals and turnout points for safety and authenticity. We provide free interlocking design software, SigScribe4, which enables you to design and order for your own unique requirements. MODRATEC Lever Frames are provided in kit form enabling excellent affordability. NEWS Click the 'Shop' link to the right. There have been some significant changes recently - things you've asked for: Calendar previews, full frame building service, Auxiliary Switch Units in DIY kit form. Go to the shop and browse. 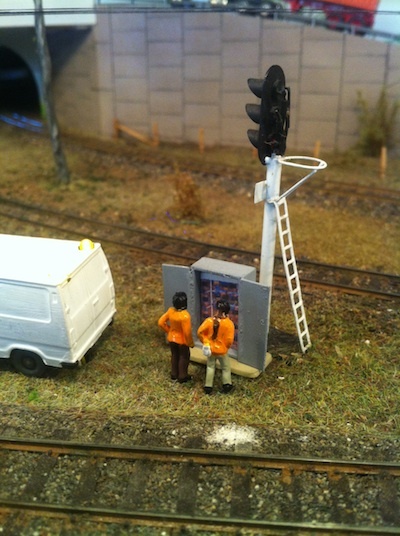 It's a way to apply Mechanical Interlocking to the Points and Signals on your Model Railway! A 12-lever example of a MODRATEC Mechanically Interlocked Lever Frame. This frame has additional electrical releases on levers 4, 7 and 10. MODRATEC has developed a system that allows virtually any railway modeller to incorporate what they have always dreamed of—realistic hands-on control of points and signals, interlocked for safety. And even if you don't have a model railway, a fully interlocked Lever Frame makes a great executive toy! Each MODRATEC Mechanically Interlocked Lever Frame is customised for your specific layout requirements. 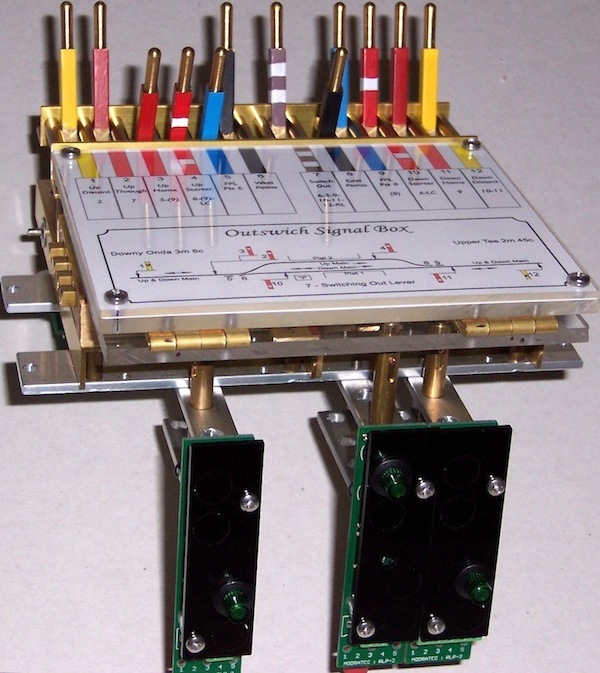 It works for mechanical control of points and signals. It works for electrical control. ... or a mixture of both. It interfaces to automatic signals. And now includes CONDITIONAL INTERLOCKING!! and EEMECK ELECTRICAL RELEASES. Interlocking design has always seemed something of a mysterious black art. To overcome this, MODRATEC has created a design tool called SigScribe4. You can download SigScribe4 free of charge. You use it to draw your track plan, place signals, and define routes. SigScribe4 then creates the mechanical interlocking design and simulates it so that you can test your design. MODRATEC uses your SigScribe4 design to generate your customised Kit and Construction Manual. Kit construction involves the application of basic workshop skills and tools. All parts are pre-drilled and tapped as required. The builder is required to file notches in interlocking tappets according to details tabulated in the Construction Manual. 2014 Wall Calendar - Exploring Railways and Signals. Please see details in The MODRATEC Shop - link to the right. Eemeck Electrical Releases for electro-mechanical interlocking functions. Please see details in The MODRATEC Shop - link to the right. Point Motor Pulser (PMP01A) series to our product range. These are designed to operate solenoid-type point motors safely and reliably using simple on/off switching. Please see details in The MODRATEC Shop - link to the right. We have released a new range of Auxiliary Switch Units that may be fitted to any of our Lever Frames. Please see details in The MODRATEC Shop. MODRATEC is now offering WIT Starter Packs so that customers may have an opportunity to give wire-in-tube control a try. You get a 6-lever Premium non-interlocked Lever Frame Kit together with sufficient wire, flexible tube, clamps, joiners and Point-wit mechanisms to operate 6 sets of points. Ideal to try out in a yard. NOW AVAILABLE - 12-lever WIT Starter Pack. We are also making available a range of basic electronic components ideally suited to railway modelling. These, together with some screw packs, are offered in convenient packaged quantities. See our new Elec, Mech Products page. Each year, at the Brisbane Model Train Show MODRATEC offers a $250.00 cash prize and certificate for the layout with the best signalling. Here is the list of winners. 2005 Graeme Lewis - Ashworth - 7mm Scale. Read article. 2006 Graeme Lewis - Ashworth - 7mm Scale. Read article. 2007 Kevin Knight - St Alban's Priory, and Greg Goodchild - Grassington & Threshfield, combined N-gauge layout. Read article. 2008 Peter Lewis - Time & Patience - HO Scale New South Wales layout. Read article. 2009 Dagabar - HO Scale Queensland layout. (Dagabar derives from the names of the team members, David, Andrew, Graham, and Bruce and Robert.) Read article. 2010 Princetown - OO Scale GWR layout - Builder: Bob Freemantle, Signal Engineer: Mark Stapleton. Read article. 2011 Dagabar - HO Scale Queensland layout. (Dagabar derives from the names of the team members, David, Andrew, Graham, and Bruce and Robert.) Read article. 2012 Dagabar - HO Scale Queensland layout. (Dagabar derives from the names of the team members, David, Andrew, Graham, and Bruce and Robert.) Read article - See 2012 Gallery. 2013 No prize this year due to inability to attend the show. 2014 Although the Brisbane show this year was otherwise very good, it was not felt that any of the layouts on show exhibited signalling to a sufficient standard to justify the awarding of the prize and certificate. A scene at Dagabar, where, just as in real life, signals occasionally fail and technicians ponder the cause. To see our Show Schedule, check this topic in the MODRATEC Guest Lounge. Our business name is not modratech, but we've added this note so that you can find us by search engine is you think it is. Also, if you are looking for sigscribe, you probably mean SigScribe4.